Intellectual property, at its simplest, refers to property or materials developed through creative thought and ideas, regardless of whether those materials were created spontaneously or commissioned. Who or what is the owner of the materials depends on the specific type of intellectual property, the details surrounding its origins, and the relationship with other parties involved in the materials. 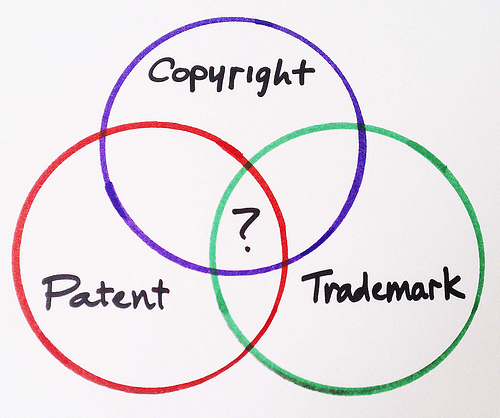 Intellectual Property: Copyright, patent, or trademark? In reality, the term “intellectual property” covers a range of specific topics. Intellectual property typically will fall into one of three categories: copyright, trademark, or patent. Each of these types of intellectual property comes with its own set of legal protections, and depending on what you intend to protect, there usually is no need to apply more than one type of protection to once piece of intellectual property. Copyright is a federal protection. Official registration with the US Copyright Office is not strictly necessary in order to exercise these exclusive rights granted by the Code. However, there are certain benefits to officially registering with the USCO that may prove useful down the line. If your company’s logo contains significant elements of original artistic expression, it may be eligible for copyright protection. If your business provides graphic design to customers, you will want to clearly define who owns the copyright on finished work: you or the client. A trademark protects something that is used to identify where a product or a service comes from. A corporate identity, such as a company logo, may qualify for trademark protection. A trademark helps describe a product without being the product. For example, McDonald’s is a trademark. McDonald’s helps describe a type of fast food, but “McDonald’s,” in and of itself, is not fast food. McDonald’s is a trademark. Preserving your trademark allows you to use it to market your products and services in a unique way and ensures that no one else can use that trademark. Patent protection applies to inventions. Inventions must be novel, useful, and non-obvious in order to be eligible for patent protection. A novel invention is something that has not previously been invented and is different than previous inventions. Inventions must be useful in that they should have a practical application. And an invention must be non-obvious in that it should be surprising and significant in its field. Patents are also registered with the USPTO. Have you dealt with any of these three types of intellectual property: copyrights, trademarks, or patents? Tell us about your experiences in the comments! Legal protections for intellectual property have a rich history that stretches back to ancient Greece and before. As different legal systems matured in protecting intellectual works, there was a refinement of what was being protected within different areas. Over the same period several strands of moral justification for intellectual property .Just like other kinds of property, intellectual property needs to be protected from unauthorized use. Great points! I wonder what was more confusing: the loose not-quite-defined intellectual property of ancient Greece, or today’s highly litigious environment where everyone is filing everything they can…? Interesting thoughts!